We are pleased to have Mayor Peggy Dunn as a Leawood Welcomer! With more than 50 years of tradition, Leawood, Kansas, set in northeast Johnson County, is both a premier residential communities and a prestigious business address. The city features an inviting mix of elegant established neighborhoods, new high-profile developments and distinctive office buildings. Leawood truly combines the best of historic tradition with the momentum of the contemporary. The city is 14.7 square miles, bordered on three sides by the cities of Overland Park and Prairie Village and on the fourth by Kansas City, Missouri. Native Americans were the first inhabitants of the area eventually established as Leawood, and in the early 1700s Daniel Boone explored the land with French and American traders. Among those who made Leawood what it is today, was Oscar G. Lee, a retired police officer from Oklahoma. sought to make those dreams real on land he purchased between what are now 79th and 103rd streets and State Line and Belinder Roads. This purchase became the foundation of present-day Leawood. Then in 1948, following the establishment of a housing development by the Kroh brothers, Leawood became the first city in suburban Johnson County to incorporate. From the start, the residents of Leawood hoped and planned for a tightly knit community with the convenience of a big city and the peacefulness of a small town. Today, with picturesque parks and streets, highly rated schools and welcoming churches Leawood is all that the founders envisioned. Leawood is one of the fastest growing cities in Kansas, with a population that has more than doubled in 25 years to over 30,000 residents. The city expects to reach an estimated 40,000 within the next 10-15 years, and has a master development plan in place to guide future development. 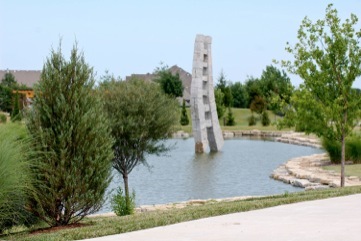 A community with sophistication and vision, based on the values of tradition, stability and appreciation of neighborhoods, this is Leawood, a unique community that is growing with distinction.